Query will help us to combine data from different tables and present it on Screen. 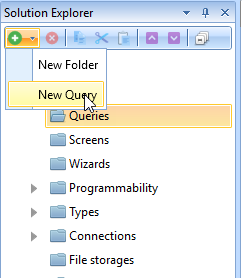 Select Queries section in Project Explorer and click Plus button. Then click New Query. 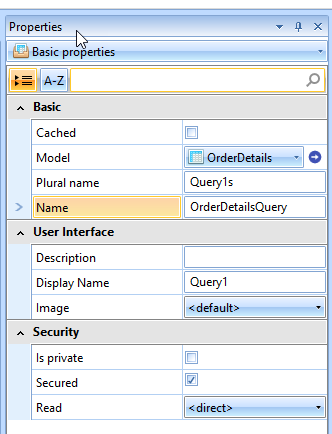 In properties select Data Source as OrderDetails and set Name to OrderDetailsQuery. Press Select Fields. 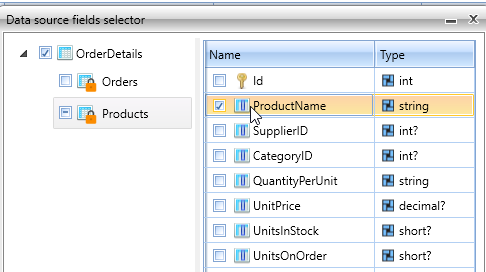 Select all fields on OrderDetails section and ProductName on Products section. Next we will need to calculate extended price for each order details row. Press "Add computed field" button. Select Expression type = Plain, Type = double?. In Format field select "currency". Actually we could achieve the same result just importing existing SQL view [Order Details Extended], but this will lead into more complicated development process. See Business Logic Placement chapter for more information.